IN STOCK This item has been discontinued. We recommend the Lequip 215 instead. The LEQUIP Model 110.5 Pulp Ejector is designed by people that juice for people that juice. 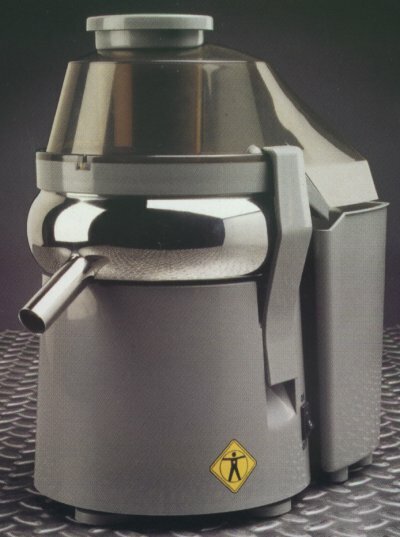 The Model 110.5 features the same patented pulp ejection system created for the original Model 221 Pulp Ejector Juicer. This eliminates clogging problems by popping the pulp upward and dropping it through the rear of the juicer. The Model 110.5 has the same stunning design features of the larger Model 221 Pulp Ejector. This more compact version - standing just 11.5" high - requires less counter space and is perfect for the space-challenged kitchen. Despite its compact design, the Model 110.5 features a heavy duty 2/3 Horse Power universal motor, providing the most power and highest efficiency of any other juicer in its class. Model 110.5 offers professional juicing at a most affordable price. The L'EQUIP Model 110.5 carries a 10 year warranty and is easy to clean. L'EQUIP is committed to manufacturing the highest-quality, most user-friendly health appliances that not only perform well but have a unique design to complement any kitchen. Excellent for the Beginner or Experienced Juicer alike! L'Equip is a company dedicated to health and well-being. With many years of experience in health-related appliances, the company was founded with a mission to create products that have true advantages over other appliancesproducts that function well and look good. We at DiscountJuicers.com prefer the Lequip 110.5 over the Juiceman II, it has a longer warranty, and is less expensive. Need further information about this product? Click here to view the manual for this juicer.